One of the benefits of using pure argan oil on your skin is that it doesn’t block pores. Because it also reduces sebum levels, it means that argan oil is an excellent treatment for acne. The high fatty acid content reduces acne inflammation, helps clear your skin, and may prevent acne scarring. Argan oil can also do wonders for your scalp and help keep your hair conditioned and looking shiny. In this article, you will find out what science really says about the wonderful benefits of applying argan oil on your skin. You will also learn how to use this versatile natural oil to improve the appearance of your hair. Argan oil is made by extracting oil from the Argan nut that grows on the argan tree which grows in Morocco. Argan oil is sometimes called Moroccan oil or Moroccan argan oil. This is not an essential oil but can be used as a carrier oil to dilute essential oils for use in aromatherapy and skin care. Argan oil is a cold-pressed oil that is mostly done by hand. This is one of the reasons why argan oil is so expensive. 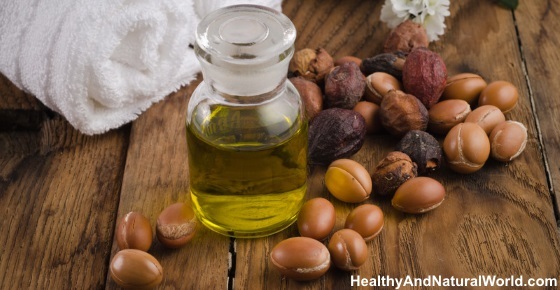 The good news is that to get the benefits of argan oil for your skin, you only need a small amount, and you may ditch many of your expensive skin care products. Although you can use it as a food, most people are interested in Argan oil’s amazing properties for your hair and skin. Let’s look in more detail at how argan oil can improve the appearance of your skin by being a natural moisturizer, eye serum, anti-aging treatment, and acne remedy. 100% pure argan oil benefits acne-prone skin because it helps reduce sebum levels on your skin and has an anti-inflammatory effect. Because argan oil is non-comedogenic and doesn’t block pores, you can safely add a few drops of argan oil to your natural anti-acne treatment. Mix 2 tbsp. honey with 1 tsp. cinnamon powder together. Add a few drops of Moroccan argan oil and 4 drops of tea tree oil. Mix well. Apply the argan oil face mask to your acne-prone skin. Leave for 15-20 minutes to help reduce oiliness on your skin and inflammation. Repeat once or twice a week to rid your skin of acne-causing bacteria and help control acne breakouts. You can find more natural face masks for acne that will help to reduce the number of pimples you have on your face. One of the benefits of pure Moroccan argan oil is locking in moisture and moisturize your skin naturally. The high levels of fatty acids like linoleic acid and vitamin E are excellent to improve the look and feel of your skin. Put one or 2 drops of pure argan oil on the palm of your hand. Rub your palms together to warm the oil. Apply in a circular motion over your cheeks, chin, forehead, and nose to moisturize your face. Repeat daily morning and night to help keep your skin moisturized and in good condition. Vitamin E, antioxidants, and fatty acids in argan oil really benefit your skin. You should find that your skin becomes more elastic and you may even notice a reduction in the appearance of fine lines and wrinkles. You can use Moroccan argan oil as a skin toner lotion to help cleanse both dry and oily skin types. Argan oil really helps to cut down on oily skin and reduce sebum levels, and at the same time hydrates the skin and prevents moisture loss. You can create your own refreshing skin toner using green tea and some essential oils. Put one green tea bag in a cup of boiling water, cover, and leave to infuse for a few minutes. Remove the tea bag and let the green tea cool. Pour into a dark bottle, add a few drops of argan oil, and a few drops of rosehip oil (or jojoba oil). Shake vigorously before each time you use it to combine the ingredients. Pour some of the argan oil toner onto a cotton ball. Cleanse your face and neck with the mixture. Use as part of your daily skincare routine morning and night to keep your skin cleansed and free of grime. The argan oil/green tea toner should keep for around 2 weeks if kept in a cool place. Did you know that green tea is one of the top teas to protect against wrinkles? Find out other ways that green tea can boost your health. 100 percent argan oil has properties that can protect your skin from the effects of shaving by preventing razor burns and bumps. Argan oil has skin benefits for women after shaving their legs or armpits. Shaving can leave your skin looking inflamed with tiny red bumps. Shaving body hair can also lead to dry skin and itchiness. Of course, argan oil can benefit men after they shave their facial hair. Argan oil is packed with antioxidants that help eliminate skin damage caused by shaving. Also, nutrients such as vitamin E and fatty acids have a soothing effect that help to improve the appearance of your skin after shaving. Immediately after shaving, put a drop or two of argan oil on your palm. Rub your palms to warm the oil. Gently massage onto your shaved skin to moisturize it and reduce inflammation. Find out more ways to prevent razor burns using natural ingredients. Pure Moroccan argan oil helps to reduce the visible signs of aging by smoothing out fine lines and wrinkles. Here are 2 argan oil recipes for reducing the signs of aging. One is an anti-aging argan oil serum and the other is an exfoliating anti-wrinkle argan oil scrub. Mix together 1 oz. of your favorite carrier oil (such as sweet almond oil) and a tablespoon of argan oil in a dark glass bottle. Add 2 drops lemon essential oil, 2 drops lavender essential oil, and 2 drops chamomile essential oil and shake well. Apply a few drops of the argan anti-aging serum to your face and neck every evening before going to bed. Use daily to help reduce the appearance of fine lines and give your skin a more youthful appearance. Remember, you only need a couple of drops of this argan skin serum on your face. The serum should keep for 4 months. Mix 1/2 cup of sugar with 1/4 cup melted coconut oil and 1/4 cup sweet almond oil to make a thick paste. Add 3 drops lemon essential oil and 3 drops clary sage essential oil. Add a few drops of argan oil and mix well. Take some of the sugar scrub in your hands and gently apply to your face using circular motions to remove dead skin cells from your skin. Leave for 10 minutes to let the argan oil nourish your skin. Rinse off with warm water and pat your skin dry. Repeat once or twice a week to help unclog pores and reduce the appearance of fine lines. Learn which other carrier oils and essential oils help reduce fine lines and wrinkles. You can apply pure argan oil from Morocco directly to damaged skin to help burns and wounds heal quicker. Put one or 2 drops of argan oil directly on the damaged skin. Gently massage into the inflamed skin to help reduce irritation, redness, and prevent secondary bacterial infections. Repeat the argan oil treatment twice a day and continue until the wound is healed. Find out why you should never pop a blister on a burn wound that is healing, and how to speed up the healing time of a wound. Moroccan argan oil contains nourishing properties that are gentle enough to use under your eyes as a serum. The vitamin E content of argan oil may help reduce the appearance of crow’s feet and fine lines under your eyes. The effective moisturizing nature of argan oil will also help to refresh dry skin around your eyes. Put one drop of argan oil on the tip of a clean finger. Use a tapping motion to apply the drop of argan oil beneath both eyes. Gently massage into the skin under your eyes to help moisturize and revitalize your eyes. Repeat morning and night to help reduce the visible appearance of aging around your eyes. Find other great recipes to moisturize dry skin around your eyes and reduce the appearance of crow’s feet. Applying pure Moroccan argan oil to your belly can help to reduce the appearance of stretch marks. Stretch marks can appear in your abdomen during pregnancy or after rapid weight loss. Put 2 or 3 drops of argan oil on the palm of your hand and rub together to warm to oil. Gently massage the oil into your belly where you have stretch marks and continue until the oil is absorbed. Repeat every morning and evening. You should start to see a reduction in the appearance of stretch marks after a few weeks. There are more natural treatments that can help to get rid of stretch marks and improve the appearance of your skin. 100% pure argan oil can help to treat the symptoms of eczema because it contains vitamins A and E as well as nourishing fatty acids. Take 1 tablespoon melted virgin coconut oil and add 2-3 drops of lavender oil for its antibacterial properties. Add 3 or 4 drops of argan oil and mix well. Apply the moisturizing argan oil remedy to your patches of eczema to help soothe and heal the lesions. Repeat twice a day and continue until you no longer have patches of inflamed skin. You can also add other essential oils that have been proven to treat eczema symptoms. Or you can try some of my other natural remedies for eczema. You can use argan oil combined with a natural moisturizing oil as your whole-body moisturizer. All you have to do to get the benefits of pure argan oil is to add a few drops of argan oil to a tablespoon of natural oil like olive oil, avocado oil, or sweet almond oil. Massage the natural moisturizer to prevent dry skin on your elbows or heels or any other part of your body needing hydration. This simple recipe makes a great argan body oil that you can use on any part of your body. Moroccan argan oil also has numerous benefits for your scalp and hair. Because it is quite expensive, you can benefit the most from argan oil on your scalp by mixing it with a carrier oil as I mentioned in the whole-body moisturizing section. Research published in the International Journal of Trichology reported that argan oil for hair can help moisturize and hydrate your hair. (18) The rich oil which is full of antioxidants benefits scalp health and can help give your hair a wonderful, healthy-looking shine and prevent frizzy hair. Argan oil can also reduce or completely eliminate your dandruff by moisturizing your scalp and repair damaged hair caused by coloring and other hair treatments. Put 3 or 4 drops of organic argan oil in a tablespoon of melted coconut oil (or other carrier oil). Take a small amount of the mixture and rub it between your palms. Rub the argan oil mixture into the ends of your hair and work your way up to your scalp. Dry and style your hair as normal. You don’t need to rinse the argan oil from your hair. Repeat the argan oil hair conditioner every time you wash your hair to keep your hair looking beautiful. You can try other natural oils for your hair to give it a shiny and healthy look. Argan oil is relatively stable. You can expect a shelf life of 1 year with proper storage (cool dark place, out of direct sunlight). Refrigeration after opening is recommended. It is recommended to use 100% pure Moroccan Argan oil for the best benefits (sometimes the Argan oil is mixed with other oils). You can purchase it through health food stores or online. Im moroccan and the pure Argan oil costs 3€ for 100 ml in Agadir. Where can i buy argan oil and how much is it?? Pure Argan oil can be bought online. Some health stores that sell herbs and essential oils may have it as well. Price depends on the brand and quantity. I NEED ORGAN OIL Where can i get it in Guntur city, Andhra Pradesh. Generally speaking, you can find it in herbal/nature stores or online (like Amazon), but you will need to do your own research as for where to buy it in your city. The argan oil is produced by Moroccan women in those so called feminine cooperatives, in the south-western Morocco. as the virgin coconut oil and avocado oil. from the root base and down to the tips. Can I mix argan oil and castor oil for hair..?? I have been given some argan oil in block form. How do I use this? Hi Paula, I’m not sure what it means when the Argan oil comes in block form as Argan oil comes in a liquid form. If it comes in a block form I assume it is a soap that contains Argan oil as one of its ingredients, but it’s not PURE Argan Oil.